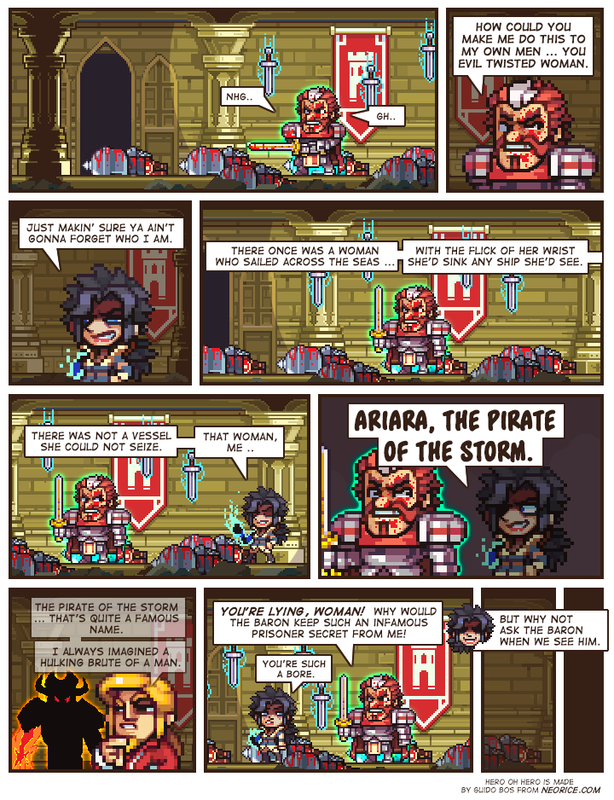 Ariara, Pirate of the storm. Thanks for your contribution, Aristocrat. Thanks for voting btw, another bonus update tomorrow! She's very wicked and badass. I like her. So much for the king's plan of not killing people. Seems like Moe and the Aristocrat could have gone along after all. The baron surely wanted to use Ariara for his own needs, that's why he kept her secret from you, general. Damn scheming nobles and their nefarious plans. Moe and Ariara were at eachother's throats before the no-killing rule was even mentioned though. They're probably officially the two characters that like eachother least in this entire story arc. I like that the imagined pirate's arm resembles Ariara's arm in the original comic. I'd imagine after spending years in a prison cell next to Moe that anyone would probably hate him.